Silsileh is remarkable for the immense quarries of sandstone from which the blocks used in the greater part of the Egyptian temples were taken. They extend on both sides of the Nile river, those on the East bank being the most remarkable for their extent, and those on the West for their curious grottoes and inscriptions. The dahabiyeh is usually moored to the West bank, but it is easy to row over the other side in a felucca, and no one should omit to do so. There is no propylon or dromos in front of the Temple of Kom Ombo, but the portico is very magnificent, and presents an imposing facade 83 feet in length towards the river. It has consisted of fifteen massy columns, five in front and three in depth. They are about 30 feet high, and nearly 20 feet in circumference at the base, and are covered with sculptured figures or hieroglyphics, with capitals modelled after the palm-branch, the doum and the lotus. The remains of the whole building are about 120 feet in length. 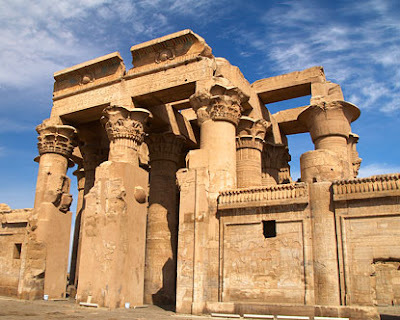 The interior is quite different from that of any other Temple of Kom Ombo in the country. It is entered from the portico by three doors, which have the globe and serpent with wings sculptured over each. The middle door leads into a large chamber, which seems to have no communication with any other part; but it is so much filled up with sand and stones, that this cannot be ascertained. The other two doors lead to passages passing on through the whole suite of four chambers, almost all of which have doors communicating with the outside, but not with each other, through the partition-wall in the centre of the edifice. . . . The whole of the interior is very much filled with sand, and the walls have partly fallen down. . . . The sculpture on this Temple of Kom Ombo does not appear ever to have been finished: the best executed is on the pronaus. Osiris is frequendy depicted with a crocodile’s head, with the sceptre and sacred tau in his hand, and receiving offerings. One curious architectural device of the Egyptians, which we found almost everywhere by looking for it, is here apparent at a glance, when one stands on the great circuit wall which encloses the whole group of edifices: their plan of regularly diminishing the size of the inner chambers, so as to give, from the entrance, an appearance of a longer perspective than exists. They evidently liked an ascending ground, the ascent of which was disguised as much as possible by the use of extremely shallow steps. The roof was made to ascend in a great degree, the descent being concealed inside by the large cornices and deep architraves they employed. The sides were made to draw in; and thus the Holy Place was always small; while to those who looked towards it from the outer chambers, (and it was entered by priests alone) it appeared, not small, but distant. 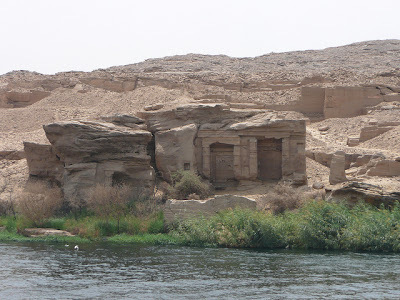 I had observed this in some of the Nubian temples, when looking at them sideways from a distance; but here it was particularly evident; the roof descending in deep steps from the portico to the pronaus; from the naos to the corridors; and from the corridors to the adyta, which last were level with the sand. When I was in the portico, looking up at the architraves, I saw into another ancient secret, which I should have been very sorry to have overlooked. Some of the paintings were half-finished; and their ground was still covered with the intersecting red lines by which the artists secured their proportions. These guiding lines were meant to be effaced as soon as the outlines were completed; yet here they are at the end of at least, two thousand years! No hand, however light, has touched them, through all the intervening generations of men; no rains have washed them out, during all the changing seasons that have passed over them; no damp has moulded them; no curiosity meddled with them. It is as if the artist had lain down for his siesta, his tools beside his hand, and would be up presently to resume his work; yet that artist had been a mummy, lying somewhere in the heart of the neighbouring hills, ever since the time when our island was bristling with forests, and its inhabitants were dressed in skins, and dyed their bodies blue with woad, to look terrible in batde. In another part of the Temple of Kom Ombo , the stone is diced in small squares, to receive the hieroglyphic figures.